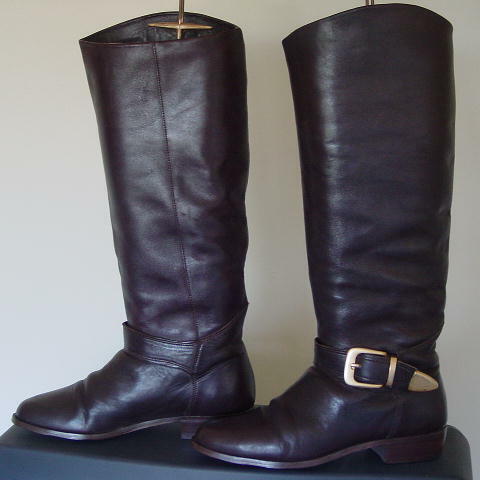 These vintage dark brown leather riding boots were made in Uruguay. They have nonskid manmade material soles and heels. There is a decorative leather strap and antique gold-tone metal buckle, loop, prong, and tip at the ankle. The outer top center is higher than the inner part. They have brown fabric linings. The boots have some scuff marks and the vamps have wrinkles. They're from an English model. 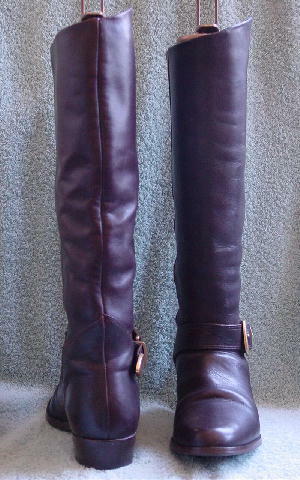 outer top of boot to bottom of heel 16 1/4"
inner top of boot to bottom of heel 15"